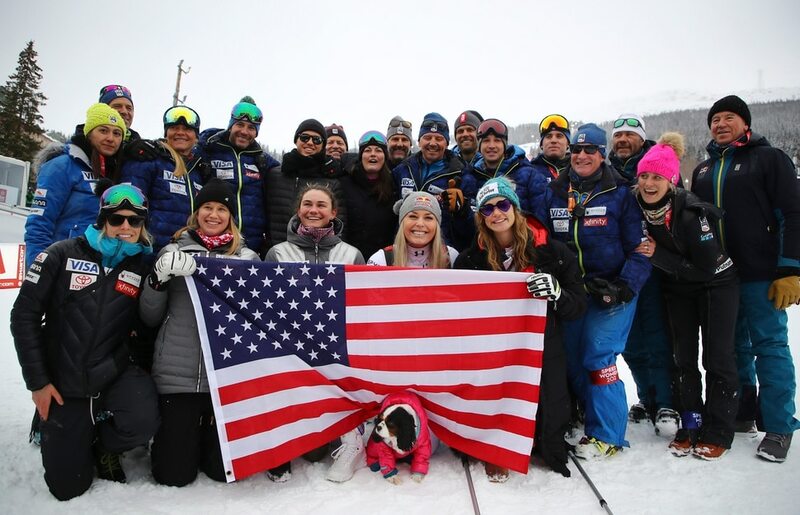 (Jean-Christophe Bott/Keystone via AP) Lindsey Vonn of the United States celebrates with the US Ski members after the flowers ceremony of the women downhill race at the 2019 FIS Alpine Skiing World Championships in Are, Sweden Sunday, Feb. 10, 2019. 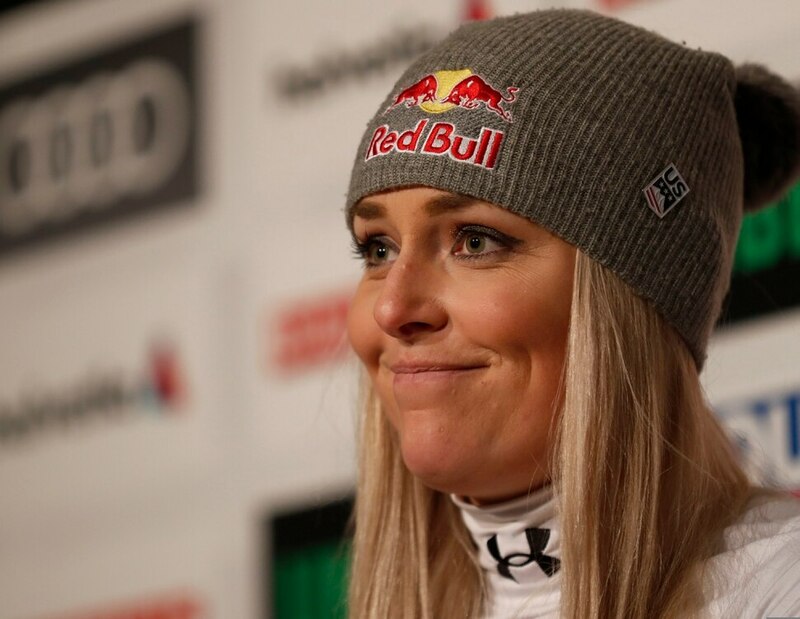 Lindsey Vonn admitted that she was nervous, "probably the most nervous I've ever been in my life" as she looked down from a mountaintop in Sweden, ready for the last run of her fearless, storied skiing career. But just as she took off, the sun came out, an omen for the Olympic gold medalist. "It was just a perfect day for downhill," Vonn told NBC SportsNet. And a perfect day for Vonn, who finished her last race cleanly in 1:02.23 and was briefly in first place in the world alpine championships Sunday in Are, Sweden. At the end, she was third, with Ilka Stuhec of Slovenia winning the event and Corinne Suter of Switzerland placing second. "I laid it all on the line, that was all I wanted to do today. I have to admit I was a bit nervous, probably the most nervous I've ever been in my life. I wanted to finish strong so badly, I had a really hard time controlling my nerves and I never have a hard time with that. I'm just happy I made it to the finish. ... I made it down safely. My boyfriend (the Nashville Predators' P.K. Subban) and my family are happy." 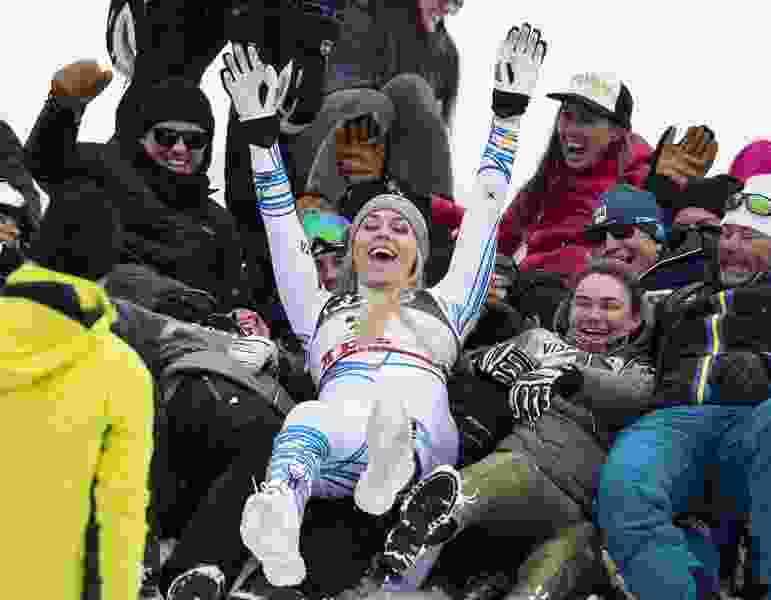 When she reached the bottom, she raised her arms in jubilation, took a bow and hugged Swedish skier Ingemar Stenmark, the only skier with more World Cup wins than Vonn. "I left everything I've got on the hill. There's nothing left," she said in an NBC video of her career. "I wish there was, but today is not a sad day. Today I get to thank everyone of you who took this ride with me. And I get to go up to the top one more time, to do what I've always done: risk it all. It's all or nothing." At 34, she had announced earlier this month that the competition would be the last of her 18-year career, her body but not her drive “broken beyond repair” by too many crashes, broken bones and torn ligaments — exacerbated by her vows to fulfill her “if you fall, pick yourself back up” motto at all costs. “It’s been an emotional two weeks making the hardest decision of my life, but I have accepted that I cannot continue ski racing,” Vonn wrote on Instagram. It wasn't so much that Vonn was unwilling to hit the mountain again as it was that the mountain kept hitting back so ferociously. Last week, she crashed spectacularly in the super G race in the Swedish resort of Ade, and it looked as if her career might not end on her terms. But, bruised from the tumble, she got up again and walked away with, as she put it, "just a black eye, sore ribs and stiff neck." It's what she does, but, as she wrote on Instagram, her body "is screaming at me to STOP and it's time for me to listen." The ledger will show that she leaves with 82 World Cup wins, 20 World Cup titles, three Olympic medals (including a gold in downhill in 2010 in Vancouver) and eight world championship medals. She became the first American woman to win gold in Olympic downhill competition and is one of only seven women to have won World Cup races in all five major disciplines of Alpine skiing — downhill, super-G, giant slalom, slalom, and super combined. She had hoped to break the record of 86 World Cup wins, held by Stenmark, but it was not to be. "I have always pushed the limits of ski racing and it has allowed me to have amazing success but also dramatic crashes. I have never wanted the story line of my career to be about injuries and because of that I decided not to tell anyone that I underwent surgery this past spring," she wrote on Feb. 1. "A large portion of cartilage that had delaminated from my bone was removed. My crash in Lake Louise last year was much more painful than I let on, but I continued to race because I wanted to win a medal in the Olympics for my late grandfather. Again, I rehabbed my way back this summer and I felt better than I had in a long time. "Then I crashed in Copper this November and injured my left knee, tearing my LCL plus sustaining 3 fractures. Despite extensive therapy, training and a knee brace, I am not able make the turns necessary to compete the way I know I can. My body is broken beyond repair and it isn't letting me have the final season I dreamed of. My body is screaming at me to STOP and it's time for me to listen. Honestly, retiring isn't what upsets me. Retiring without reaching my goal is what will stay with me forever."